American Journalism Review magazine published a series of stories in September exploring the decline of investigative journalism around the country. I was surprised when I discovered that the writer decided to lead with me on the main story when I had been part of another article, The Withering Watchdog, a PBS series published last year. Yet, I commend American Journal Review for spending the time and ink to show how investigative journalism has been affected in recent years. 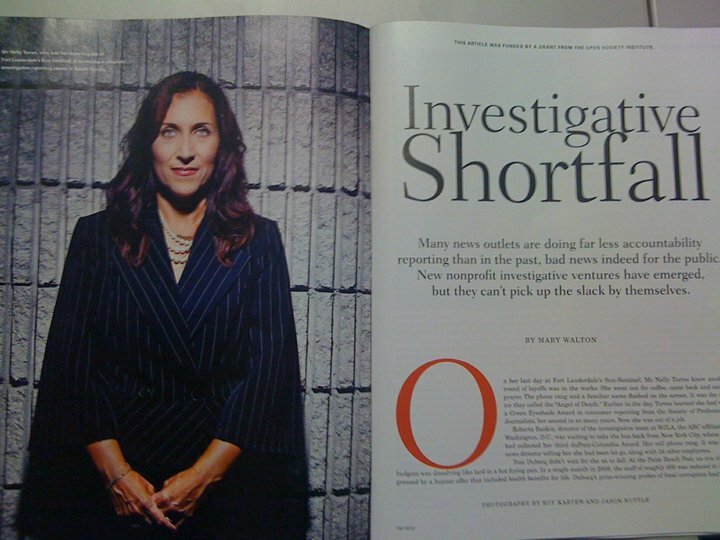 The article, by Mary Walton, also highlights the explosion of investigative nonprofit centers across the country. Interestingly, this is something I had devoted a lot of energy during the past 15 months, building the framework of Florida Center for Investigative Reporting. I’m hoping this will be the last article I read about the decline of investigative journalism though. Many of us are working hard to produce investigative journalism that matters. We are committed to our work because we believe that this is the future of investigative journalism. At least for now. Think about it: if you don’t know what the government is doing with your dollars, or if corruption is running amok, how would you know? It’s the media’s job to keep you informed about these issues and more. But as resources shrink in newsrooms across the country, so has the ability to dedicate time and energy to produce in-depth reporting. We can’t allow that to happen. I care too much about my community to ignore all these facts and that’s why I’m proud to be part of Florida Center for Investigative Reporting. I hope the future holds more stories about the growing trend of investigative nonprofits around the nation and how these new start-ups are seeking new innovative ways to become sustainable. But more importantly, how they are using all the technology available to produce stories that cause change and make this world a better place. Last week, the Florida Center for Investigative Reporting became the first nonprofit watchdog in the Sunshine state to receive a $100,000 grant from the Oklahoma City-based Ethics and Excellence in Journalism Foundation. FCIR is the nation’s first nonprofit, digital and bilingual investigative journalism organization. News of our grant circulated rapidly through industry blogs and social media. But FCIR’s success in fundraising didn’t happen overnight. In fact, we have worked for more than a year to grow FCIR from its seed as a simple idea to a viable journalism organization. That idea was to meet a growing demand in Florida by producing investigative journalism about one of the nation’s most populous and diverse states. To accomplish this, we’d use the latest technologies and storytelling techniques to connect with diverse audiences throughout the state. As we brainstormed and consulted with colleagues across the country, we determined that we needed to be different from other nonprofit news organizations. Why? Because Florida serves as the gateway to Latin America and the Caribbean and its communities are among the most complex and diverse. FCIR needed to appreciate that complexity and reflect that diversity. For that reason, we made an early commitment to produce journalism in both English and Spanish. Among our initial tasks was to recruit a strong, diverse board of directors and an advisory committee. Each of our board members brings a unique skill set, which includes journalism, management, nonprofit administration, digital media and law. As we grow, so will our board and advisory committee. In addition to an accomplished and committed board of directors, FCIR needed a home. The International Media Center, a nonprofit affiliated with Florida International University’s school of journalism and mass communication, system offered us that. IMC has an impressive, 20-year history of training journalists in Latin America and the Caribbean. It is a perfect marriage. FCIR’s partnership with IMC will allow us to create a substantive internship program that will help train the next generation of investigative reporters in Florida. Yet FCIR will never lose sight of its mission to be a content provider of investigative journalism. For that reason, FCIR has established a network of ethnic and traditional media outlets that will publish FCIR’s journalism and at times collaborate on projects. By collaborating with English- and Spanish-language media, FCIR can reach Florida’s diverse audiences on all available platforms– online, broadcast, radio, print and mobile. What’s more, FCIR’s partnership with the First Amendment Foundation in Tallahassee will foster collaboration with citizen watchdogs around the state. We believe that engaging the public is crucial to make this new model of investigative journalism successful. Although FCIR began as a simple idea, it has grown into a public- and foundation-supported nonprofit organization with an important mission — to work in Florida’s public interest by exposing corruption, waste and miscarriages of justice. Note: FCIR is seeking watchdog projects from Florida journalists to fund this year. Deadline is Sept. 30. Proposals can be e-mail to watchdogfund@fcir.org. Mc Nelly Torres is the associate director and reporter of the Florida Center for Investigative Reporting and a board member of the Investigative Reporters and Editors organization. Torres has been a member of NAHJ since 1998. This blog item was also published by NAHJ Sept. 13.